Never to get caught in the dark without a light while equipped with AA Mini Light Holder from Tru-Spec. 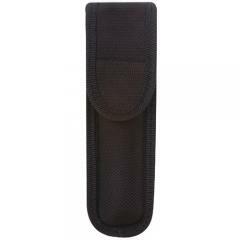 Constructed from high-strength nylon with reinforced double-stitched seams, this tactical holder delivers the rugged durability demanded by tactical and law enforcement professionals. Its resilient exterior is both water and abrasion resistant and features a hook-and-loop fixed cover flap that keep your flashlight dry and secure through any environments. An enlarged lip on the flap is easily gripped, delivering speedy item access at a moment's notice. The carrier is machine washable for easy maintenance and is attached via a 1.75 inch belt loop.